Mark Allen was a "slow burn" indie writer who put out a number of short stories and novellas in the beginning of his indie career, most of which sold a very modest amount of copies. However, with his first full-length novel, THE ASSASSIN'S PRAYER, Allen's success as an indie writer took off in a very impressive fashion. Now, although his sales have slowed slightly since the book's initial release, Allen's novel of bloodshed and redemption is still going strong. 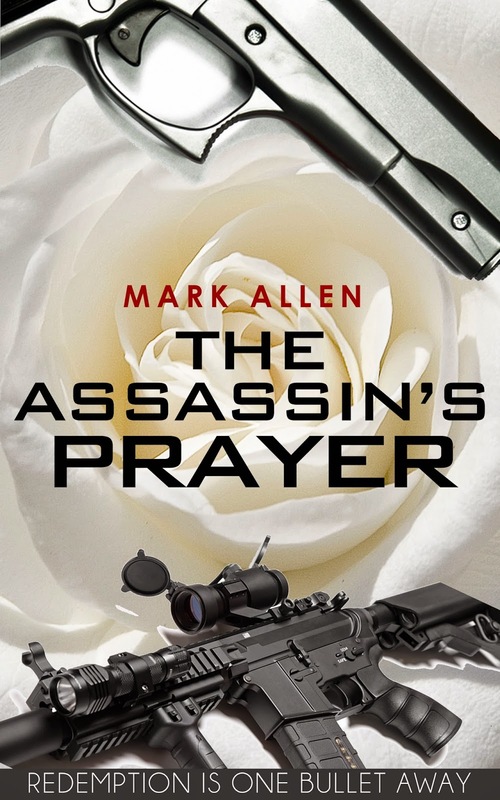 THE ASSASSIN'S PRAYER is the story of Travis Kain, a killer-for-hire who once worked for the CIA, but now most often sells his services to organized crime. He lives in a state of almost constant melancholy after the death of his wife several years ago, using violence to dull the pain of his loss. When we meet him, Kain is contracted to kill off another organized crime "made man" of some considerable status, and while the job goes mostly as planned, there are complications involving some innocent witnesses. Kain has vowed to never harm innocents (part of the "prayer" which gives the book its title), and so walks away from tying off these loose ends, an act that has serious consequences for him later on. Kain also runs into an old flame from years gone by, and this kindles some old passions he thought were long-dead. There's a lot of conflicting emotions going on, as Kain tries to sort out his feelings for this old flame while still hurting from the loss of his wife. To further complicate matters, the CIA - who never drop a grudge - sends one of their top "operators" after Kain, because apparently his departure from the Agency was less than mutually accepted. The operator who goes after Kain is a real sumbitch, and he's got a whole cadre of other sumbitches along with him. All of this comes together to create a pretty action-packed, dramatic novel. Allen is a big fan of the action genre, and heaps it on with gusto. The violence is bloody and unforgiving, and some of the fights are spectacularly gruesome. If you're not into vivid depictions of violence and gore, this may not be the book for you. Taken as a whole, TAP is a solid debut novel. There are a couple of major coincidences that form plot points in the story, and they'll either make or break a reader's enjoyment of the novel; either you'll accept them and move on, or you'll lose your suspension of disbelief and fall out of the story. I was willing to carry on and swallow the coincidences, but I'm sure it'll be a deal-breaker for some readers. There is also a lot of emotional conflict, most of it tied to both the death of Kain's wife and the rediscovery of his long-lost flame, but there's also some deep-seated angst regarding his former best friend, whom Kain now despises. There were several times I just wanted Kain to cowboy up and quit weeping into his whiskey. If I wanted to be cheeky, I'd refer to Kain as an "Emo Assassin", but since the story moves at a pretty brisk clip, the maudlin moments don't slow the story down, and I think it helps distinguish Kain from the legion of near-robotic Grim Hired Assassins out there. Some other reviewers clearly liked a more complicated, emotional protagonist, while others found it annoying. As usual, your mileage may vary. So if you're interested in a cool Hired Killer Thriller, consider picking up THE ASSASSIN'S PRAYER. And if you're such a cheapskate that you don't want to invest $2.99 on the book, check out some of his other works, such as "The Killing Question" and "Resurrection Bullets". Allen has quite the collection of varied short stories, and I'm sure there's something for everyone. Thanks for the review, Jack. I actually chuckled at your "Emo Assassin" line. As you pointed out, I deliberately attempted to create a different kind of action protagonist than what typically populates the genre, someone more tortured and emotional than the "Mack Bolan" type heroes. Some love it, some hate it, but thus far nobody has accused it of being "the same ol' thing," which is exactly what I was trying to avoid when I wrote the story. Insanely good book. Buy it.